More than two hundred units of the Royal Navy carry out duties as auxiliary ships. They include surveying ships, monitors, sloops, target ships and many other types which render invaluable assistance to the Navy as well as to navigation in general. 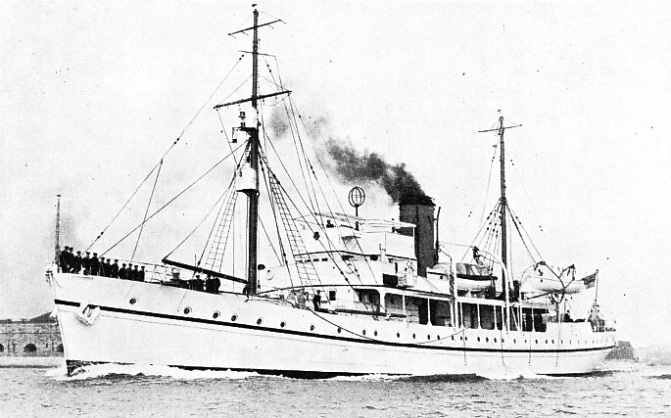 A NAVAL SURVEYING SHIP, HMS CHALLENGER, was built at Chatham in 1931 originally as a fishery investigation vessel. She has a displacement of 1,140 tons and her reciprocating engines, developing 1,200 horse-power, give her a speed of more than 12 knots. Continuing the work of her famous predecessor during the voyage of 1872-76, described in the chapter beginning on page 953, HMS Challenger has done invaluable surveying work off the coast of Labrador. THE Royal Navy has so many different functions to perform that it requires, in addition to the strictly combatant types such as capital ships, cruisers, destroyers and the like, a whole fleet of auxiliary vessels, large and small. Hence we find in the Navy List such categories as monitors, sloops, net layers, minesweepers, surveying vessels, river gunboats, special service vessels, yachts, tugs, trawlers and whalers, drifters, depot ships, a hospital ship, repair ships, and “miscellaneous small craft”, running into a total of well over 200 units. The majority of these possess only a limited fighting value, and some are unarmed, but every vessel has its appointed and indispensable place in the vast organization controlled by the Admiralty. Of particular interest are the two “special service vessels”, Iron Duke and Centurion. Both are ex-battleships which have helped to make history. 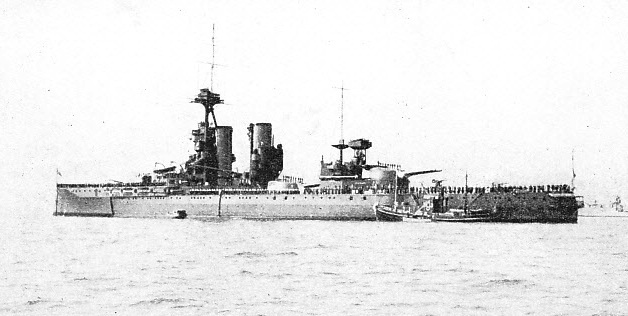 The Iron Duke was flagship of the Grand Fleet in 1914-16, and carried Lord Jellicoe’s flag at the battle of Jutland. One of five capital ships which had to be discarded in 1930 by international treaty, she was fortunate enough to be reprieved from the shipbreaker to serve as a gunnery training vessel. She was first demilitarized by the removal of all side armour and of four of the big guns, and by the reduction of boiler power to bring down the speed. In her new role she makes periodical cruises with parties of officers and men on board who are undergoing special gunnery instruction. The Centurion, which also fought at Jutland, was disarmed about 1927 and converted into a wireless-controlled target ship. So perfect is the system of radio control that she can be made to perform almost all the evolutions of a fully-manned ship without a soul being on board. When about to be used as a target for the guns of the Fleet, the Centurion is abandoned by her crew, who are taken off in the destroyer Shikari. It is from the switchboard in this vessel that the subsequent movements of the target-ship are controlled from any distance up to a mile. Radio impulses from the Shikari actuate the oil-fuel burners and steam valves of the robot battleship, causing her to increase or decrease speed. By the same method the ship’s rudder is moved to make her turn to port or starboard, to zigzag, or to follow a steady course. She can even send up a smoke screen to hide herself from the “enemy” gunners. FORMERLY A BATTLESHIP of 25,500 tons displacement completed in 1913, HMS Centurion is now a wireless-controlled target ship. The speed and course of the Centurion are controlled by wireless from an accompanying destroyer, so that she forms a realistic and safe target for gunnery practice. Thousands of shells have hit the crewless Centurion, but the damage is quickly repaired. A SUBMARINE DEPOT SHIP is attached to every group of submarine flotillas and acts as a supply ship. The Medway (middle), of about 15,000 tons displacement, can “mother” as many as eighteen submarines. Completed in 1929, the Medway has a speed of 16 knots and is armed with two 4-in guns and four 4-in anti-aircraft guns, in addition to twelve smaller guns. Her diesel engines have a total horse-power of 8,000. A SLOOP OF 990 TONS HMS Lowestoft was completed in 1934. She has a length of 266 feet overall, a beam of 34 feet and a draught of more than 7 feet. The Lowestoft’s engines develop 2,000 horse-power and drive her at a speed of 16 knots. In peace-time sloops often fulfil the duties normally carried out by cruisers overseas. Their fighting value is small. In the course of her career as a target the Centurion has been hit by thousands of shells, and but for the exceptional strength of her armour she would long since have gone to the bottom. After a “shoot” she presents a forlorn spectacle, with funnels and upper works torn and twisted, and shell holes gaping in her flanks, but as most of the damage is superficial it is speedily repaired. The possession of this robot ship enables naval gunnery to be practised under realistic conditions. There are eight monitors in the Navy List of 1936, all dating from the war period, but the only two of any present-day importance are the Erebus and the Terror. The Erebus is now in reserve, and the Terror is stationed at Singapore. These sister ships were built expressly for bombarding work, and were made torpedo-proof by the fitting of enormous bulges, extending many feet beyond the hull proper. They are 405 feet long, with a beam of 88 feet, and they can steam at 12 knots. On the foredeck rise a huge barbette and gun-house or turret containing two 15-in guns on high-angle mountings which give the vessels a range of well over 20 miles, and on either broadside (in the Terror) are four 4-in quick-firers. Despite their ungainly appearance, the ships are quite seaworthy, besides being steady gun platforms. Their exceptional powers of resistance were demonstrated during the war of 1914-18, when one was hit simultaneously by three torpedoes and the other withstood the explosion of 500 lb of TNT against her hull when struck by a distantly-controlled motor-boat. Both monitors returned to duty shortly afterwards. Sloops are used for all sorts of purposes. The oldest of those now in service were built for minesweeping, convoy and anti-submarine work, which still remain the principal functions of the type. Sloops, however, are attached to all the cruiser squadrons on foreign stations, and on occasion deputize for their bigger sisters. Should a remote British community be endangered by earthquake, flood or political unrest, a sloop may be sent to its aid in place of a cruiser. No fewer than twenty-three sloops are serving abroad at the time of writing. Being comparatively cheap to build and maintain, they often prove useful substitutes for cruisers in peace-time service, though their fighting value is small. Between 1928 and 1936 fifty-one sloops were built or ordered, including several for the Dominion navies. The largest sloops are of the “convoy” class, 1,190 tons, with a speed of 18 knots and an armament of four 4.7-in guns. The smallest are of the “ coastal class, 58-5 tons, 20 knots, mounting a 4-in gun; they are specially designed for the hunting of submarines. Patrol and minesweeping sloops are intermediate in size, with an average speed of 16½ knots and two 4-in or 4.7-in guns. The two net layers, Guardian and Protector, represent a type of more recent origin. Their principal function is to lay a barrage, or zareba, of antisubmarine nets round a squadron of men-of-war at anchor. For this purpose they are equipped with multiple nets fitted with sinkers and buoys, and with special gear for rapidly paying out and retrieving the nets. These ships are used also for fleet photography, particularly in connexion with gunnery practice. A large cabin at the stern contains up-to-date equipment for taking moving and other pictures at sea, as well as for developing and duplicating films and negatives at short notice. Thanks to their size and good speed (2,860 tons, 18 knots), the two ships can be used also for towing gunnery targets. For all-round utility, therefore, they would be hard to beat. Distinct from the sloops are twenty four minesweepers named after towns - Aberdare, Bagshot, Fareham, Harrow and so on. All were built in 1917-19. The displacement is 710 tons, the speed 16 knots, and the armament comprises one 4-in gun and some smaller pieces. The duties of this type are indicated by its description, but several minesweepers are used for odd jobs connected with training. Although not fighting ships in any sense of the term, the ten surveying vessels are among the most important units of the Navy. It is due to their work that home and foreign waters are kept safe for navigation, for it is largely from the data supplied by them that the incomparable Admiralty charts are prepared and kept up to date. 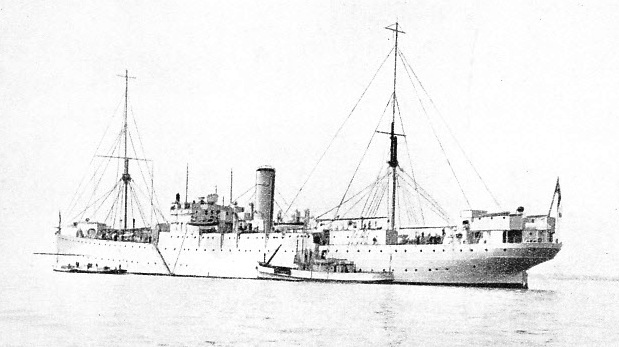 FLAGSHIP OF THE GRAND FLEET in 1914-16, the battleship Iron Duke was demilitarized in 1930 under the provisions of an international treaty, and converted for use as a gunnery training ship. Built in 1912, the Iron Duke had a displacement of 25,000 tons and was armed with ten 13.5-in and twelve 6-in guns, as well as smaller pieces. Now four of her big guns have been removed, as well as her side armour. Next in the list come the river gunboats, eighteen in number, for duty on the Chinese waterways. The largest are the eleven vessels of the “Insect” class, displacing 625 tons, with a speed of 14 knots. With few exceptions they mount the heavy armament of two 6-in. and nine smaller guns. Seven smaller boats have recently been built. The Royal yacht is, as its title implies, reserved for the use of the Sovereign and members of the Royal family. Built in 1899, the Victoria and Albert is still a beautiful and stately vessel, of 4,700 tons displacement, with a pronounced clipper bow, overhanging stern, two funnels and three raking masts. She has a speed of 20 knots, and is one of the few remaining vessels on the active list to burn, coal. The convoy sloop Enchantress is occasionally employed as an Admiralty yacht, for which purpose extra cabins have been built aft and one 4’7-in. gun is temporarily out of the ship. Over sixty trawlers and drifters were engaged in Naval service in 1936. Trawlers are used primarily for mine-sweeping, but several are attached to the Fishery Protection Flotilla. Drifters act as messengers and “taxis” for the big ships, conveying liberty men to and from the shore, and bringing off provisions and stores. They are smart little craft, bearing such attractive names as Crescent Moon, Indian Summer, Lunar Bow, Seabreeze, Sunset and the like. They are manned by crews drawn from the big ships they serve. The latest Admiralty trawlers are exceptionally staunch vessels, commanded in an emergency by Chief Skippers or Skippers of the Royal Naval Reserve. The Navy’s depot ships form a fleet in themselves. Every flotilla group of destroyers and submarines has its own parent ship. She “mothers” her brood by keeping them supplied with fuel, provisions, stores and spare gear, and undertaking all save the heaviest repairs in her own workshops. She acts, too, as a floating club, where officers and men from the flotilla, when not on duty, can sleep and mess more comfortably than in their own quarters. Two modern examples of this class of ship are the Medway, a diesel-engined vessel of about 15,000 tons, which can serve the needs of eighteen submarines at once, and the Woolwich, a destroyer depot ship of 8,750 tons, fitted with numerous spare cabins, and workshops fully equipped with machine tools of the latest types. In all there are three depot ships for destroyers and five for submarines. In HMS Resource, built in 1928, the Mediterranean Fleet has almost the equivalent of a floating dockyard. She is officially designated a Fleet Repair Ship, and contains plant for making good material damage to other vessels and for manufacturing any special gear they may require when away from their usual bases. During the war of 1914-18 fleet colliers represented the most numerous class of Fleet Auxiliary vessels, but to-day not a single collier remains on the list. They have been entirely superseded by the “oilers”, or Fleet tankers, of which in 1936 over fifty were in service, the largest having a deadweight capacity of 15,350 tons. Much of the oil fuel used by the Navy is transported in these vessels, which also replenish stocks at the Fleet’s bases at home and overseas. Finally, there are two ships used exclusively for the carriage of petrol. The only notable type among the “miscellaneous small craft” is the motor torpedo-boat, formerly known as C.M.B. (coastal motor-boat). After having suffered eclipse for a number of years, the type has recently been revived, and in 1936 six units were being built for the Admiralty. The boats were expected to have a speed of over 40 knots. “MOTHER” SHIP to a flotilla of submarines, HMS Cyclops, a submarine depotship of 11,300 tons displacement, contains all kinds of stores, fuel, spare gear and provisions. All but the heaviest repairs can be carried out from the Cyclops and the four other ships of her type. 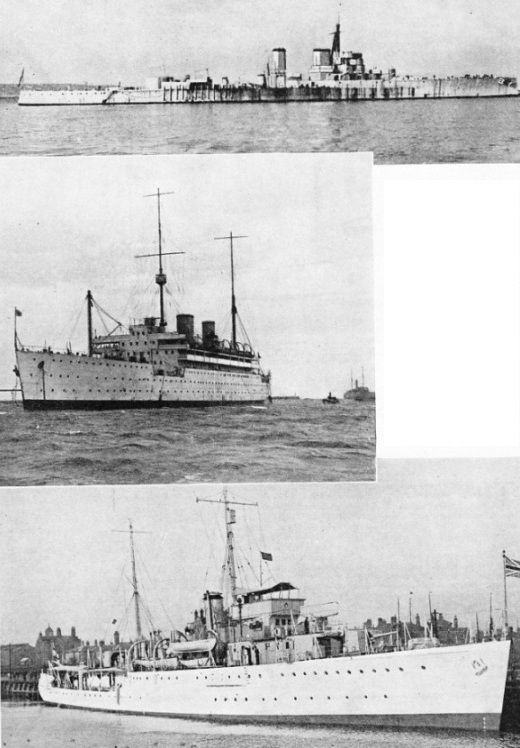 You can read more on “The Convoy System” and “Troopships and Trooping” on this website.